Gorman-Rupp hydraulic submersible pumps are designed for trash-handling, dewatering applications and for pumping dirty liquids such as mining and paper plant wastes. They are also excellent for pumping sewage from digester and holding tanks as well as sewer bypass. Because they operate without using electricity, they are well suited for applications where electricity is hazardous. Pump speed can be varied to meet job requirements, providing maximum efficiency and minimal fuel consumption. This makes these pumps much more efficient than constant-speed, generator-driven electric submersibles. 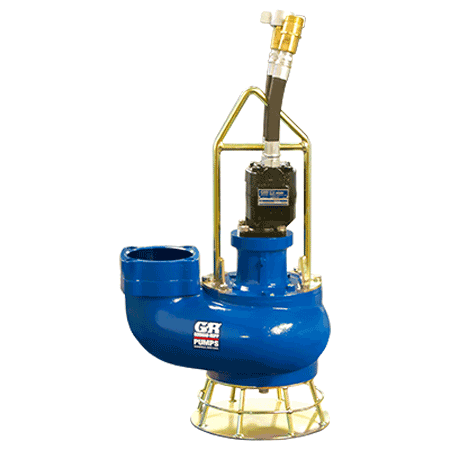 Six-inch pump is designed to fit through 24" manholes. No electric hazards. No suction limitations. Hydraulic power units for 3" pumps are equipped with 13hp Honda gasoline or 10 hp Yanmar diesel engines on wheel kits. Power units for 4" and 6" sizes are equipped with a 63 hp Deutz diesel engine and skid base as standard.